We're back! JP was on vacation last week, so I really thought we'd blog more. It wasn't for lack of material, that's for sure. We'll post about our "stay-cation" adventures soon, but in the meantime here is a fun little project I've been thinking about doing for awhile. Since I am without the use of my left hand for a few more days (Don't know what I'm talking about? Go here) this will be light on verbiage, heavy on pictures. Earlier this summer I got hooked on Starbucks 100-calorie frappuccinos in the bottle. I'm usually an iced chai kinda gal, but I figured I would save on time and money if I went this route. One day at work I had an epiphany! The tiny bottles would make perfect little vases. Much to the annoyance of everyone in my family, the bottles started accumulating on the counters and eventually had to be packed and moved to our new house where I finally stowed about 8-10 in various kitchen cabinets. I originally planned to spray paint them white based on our first pass at a breakfast nook wall color (light aqua), but after changing the paint color twice since then (now it is, and will remain, pale warm beige), I finally decided that a darker color would look better. 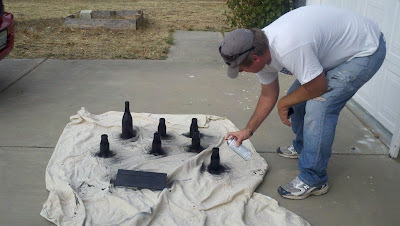 JP and I are really into chalkboard paint right now, so I peeled off the labels and had him spray six of the bottles with black chalkboard spray paint we had in the garage. I think I want to use twigs instead of flowers to make them a bit more fall/winterish. Maybe tie some twine around the top? So many possibilities! I will probably spray the remaining bottles with regular spray paint in fun colors at some point. Until then, I should probably just learn to recycle my frappuccino bottles the old-fashioned way. What else do I love this week? The beautiful way the fall weather has enveloped my landscape. Today I woke up to a romantic misty layer over the vines. And don't even get me started on the wistful grayish-purple clouds in the background. Sigh. I have been trying to get a good picture of the corn across the street for weeks. Today I couldn't miss the opportunity to capture my favorite type of cloud, the cumulus, as they hung comfortably over the corn fields. Full disclosure? As pretty as the corn scene was, it was anything but peaceful as I dragged LJ across the street with my good hand to get more up close and personal with the corn. I tried to reason with him to stay dutifully by my side as an "assistant photographer," instead of running into the road or rolling into a drainage ditch. I finally had to wrap my legs around him like a vice to get him to stay put for two seconds while I composed the shot and released the shutter with my working thumb and forefinger. Needless to say, those pictures were not blogworthy. Did I mention it also smelled like someone dropped a methane gas bomb in our general vicinity? I prayed we were just downwind of the local cattle ranch. We weren't. Eesh. I'm linking up with Lollipops for What I Love Wednesday. LOVE the chalkboard paint vases! I have yet to use chalkboard paint, but have always wanted to. They came out so cute! The chalkboard vases need to go on pinterest friend! I'm impressed with the amount of words with one hand! You've gotten this one handed thing down I think! Thanks for reading and liking my project friends! @kate - go get some chalkboard spray paint soon! You'll love it! i am soooo doing this!